We have twelve different wines in stock now from Cameron Winery. Check out some highlights below and click here to shop them all! VinopolNote: Abbey Ridge sits high atop the Dundee Hills; a collection of vines planted on their own roots in the mid-70’s. It’s unquestionably one of the most special sites in the Willamette Valley and though it’s better known for Pinot Noir, the Abbey Chard is fantastic. This is the most limited of the Chardonnay bottlings from Cameron and isn’t produced every year (there was no 2014 version). VinopolNote: The Clos Electrique is Cameron’s estate vineyard, named after the electric deer fence that surrounds it. This is planted to a mix of clones and is vinified traditionally—no racking and all in older barrels. This is crisp and coiled, with distinct minerality and a lot of power in a lithe frame. Like most vintages of the Electrique Blanc, this is quite good now but will be stellar in a few years. Uber delicious with lots of upfront, robust appeal. 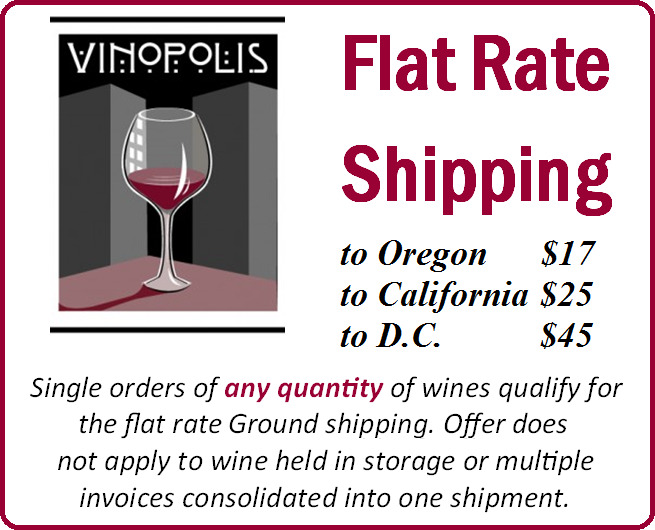 Buy a case and drink this while you wait for the other Pinots to reach maturity! VinopolNote: Abbey Ridge is one of the most hallowed sites in the Willamette Valley. Planted in 1975, the Pinot Noir here is own rooted and at one of the highest elevations in the Dundee Hills. The elevation and classic Jory soils give the wine an intense personality—high toned, elegant and tensile, with good power and a strong voice. This bottling has been one of the defining Oregon Pinots since John Paul started making it. We’ve got a ton of fantastic rosé in stock for warm weather drinking! You can see all 75 bottles that are available in our web store by clicking here, but we wanted to highlight one of our favorites every day. Today we’re focusing on this beauty of a bottle from classic Provencal producers Chateau de Roquefort. Fresh, delicious and minerally, it’s at home on the porch or next to a delicious meal. Beautiful Condrieu, perfect for spring. Party in a bottle. Spritzy and fun. Beautiful and powerful. This is stunning, especially for the price. We probably shouldn’t bother with the single-bottle price. Beautiful, new-school, crisp Chard from Napa. One of the best deals in Willamette Pinot we’ve had in a while. The Willamette Valley is still a young wine region and if you need proof, you only have to look at the number of wineries starting up every year and the new voices they’re bringing to the table. Two of the more notable young wineries in the valley are Morgen Long, maker of some of the best Chardonnay to come out of the state, and Flaneur, whose wines offer exceptional value. The Morgen Long wines, in particular, are worth the time of anyone who loves white Burgundy—these are linear, mineral wines with real spine and intensity. VinopolNote: A unique Chardonnay! This is composed of 25% each Seven Springs, Durant, AlexEli and Yamhill Vineyards fruit with a splash of Maresh Vineyard Pinot Noir lees. The lees addition adds texture, body, and a fascinating twist to the beautiful aromatics. While the modern conception of the Southern Rhone is all 15%+ alcohol monsters with lots of new wood, there are still a few holdouts who value an old school style. Gour de Chaule is a top example, in the heart of the Southern Rhone but with drinkability in their hearts. These are powerful wines, but with a soulful edge and a freshness that makes them immensely appealing. When you factor in their pricing, they become can’t miss offerings for anyone who longs for older style wines from the Rhone. I recently had a chance to try both the 2015 and 2005 Gour de Chaule Gigondas at a dinner and was blown away both by the depth, complexity and freshness of the older version as well as the promise that the younger version clearly showed. On a night with a number of other world class wines open, this sub $30 bottle was one of the highlights. I’ll be grabbing a few to open in 10+ years, confident that it’ll be suitable for any occasion, no matter how fancy. The wines of Chandon de Briailles are old-school Burgundies and brilliant because of it. Made with lots of whole clusters and an age-worthy approach, they are wines that need time but pay off in a big, big way. The estate has been a bit of an insider secret for years, as these wines are fantastic for their prices. Speaking of those prices—the Burgundy market tends to reward wines that drink well on release and/or come from prestige appellations. These wines are neither (though Corton was quite the glamorous location a few hundred years ago). They require time to come into their own, putting on weight and texture in bottle until you open them up and they show up every other wine on the table (including many that released at triple the price). They’re special wines, which we’re offering at very special pricing If you like structured, old-school Burgundy, don’t pass these up. Chateau Meyney is a perennial best value in Bordeaux. One of the oldest estates in the region, it’s superbly situated on some of the best vineyard land in St. Estephe, though it curiously isn’t a classified growth. That’s helped to keep the price down, despite the fact that the wines age as well as any in the AOC aside from Estournel and Montrose. The ’82 and ’86 are still stellar and the ’89 and ’90 have only recently moved into their prime. That wouldn’t be much to talk about except that we’re talking about a $40 wine—and that’s for current releases from strong vintages. We’ve just confirmed our stock of the 2016, arriving in the fall, and the ’14 is here now. The hill of Hermitage is both one of the most famous wine landmarks in the world and also so much more interesting than common lore purports it to be. The story goes that the hill of Hermitage was the home of a knight seeking solace from the horrors of the Crusades upon his return home. He planted the vineyards that would become Hermitage and then built a chapel to pray in and that building, the Chapel of Saint Christopher, is the defining marker of the hillside. The name, Hermitage, takes the name of the hermit’s refuge. Jaboulet purchased the Chapel of Saint Christopher and the surrounding plot of land in 1919—possibly the choicest part of the whole appellation. This is the core of their blend for La Chapelle, which for many defines what Hermitage can be. The 2016 version is a true legend in the making and we expect this will be a wine that is talked about reverentially in twenty years. We have a small lot of ’16 La Chapelle arriving in the Fall, along with the 2016 version of the Thalabert Crozes-Hermitage (a worthy follow-up to the best selling 2015). Quantities are limited, so you’d be wise to grab these now—they aren’t going to be around for very long.